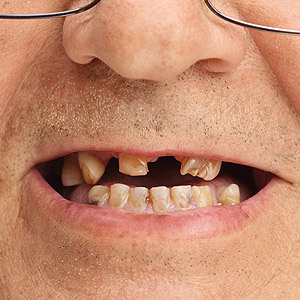 There are plenty of options today for replacing missing teeth, including dental implants. But if the teeth have been missing for some time, complications can arise that limit your restorative options. The most consequential possibility is bone loss. Bone has a life cycle: old cells dissolve (resorb), and are then replaced by new cells, stimulated to grow by the forces applied to the teeth during chewing. But the bone won't receive this stimulation if a tooth is missing — so growth slows down, which causes the bone volume to diminish with time. Another complication can occur involving other teeth around the open space. These teeth will naturally move or “drift” out of their normal position into the missing tooth space. As a result we may not have enough room to place a prosthetic (false) tooth. If either or both of these complications occur, we'll need to address them before attempting a restoration. Bone loss itself could eliminate dental implants as an option because they require a certain amount of supporting bone for correct placement. Bone loss could also make correcting misaligned teeth difficult if not impossible. It might be possible, though, to regenerate lost bone with a bone graft. The graft is placed, sometimes along with growth stimulating substances, within the diminished bone area. It then serves as a scaffold upon which new bone can form. If the bone becomes healthy again, we can then attempt to move any drifted teeth back to where they belong. Besides braces, there's another treatment option especially popular with adults: clear aligners. These are a series of removable, clear plastic trays that, like braces, exert gradual pressure on the teeth to move them. Patients wear each individual tray for about two weeks, and then switch to the next tray in the series to continue the process. Unlike their traditional counterparts, clear aligners can be removed for cleaning or for special occasions. More importantly, they're much less noticeable than traditional braces. Once any problems with bone health or bite have been addressed and corrected, you'll have a fuller range of options for replacing your missing teeth. With a little extra time and effort, you'll soon be able to regain a smile you'll be proud to display. If you would like more information on dental restoration, please contact us or schedule an appointment for a consultation.